1. BEFORE HIRING AN OUTSIDE BAKER, see what your caterer has to offer. If a cake is included in the package but you’re not crazy about the colors or design, try working with the in-house baker on some tweaks to make it more to your liking. 2. 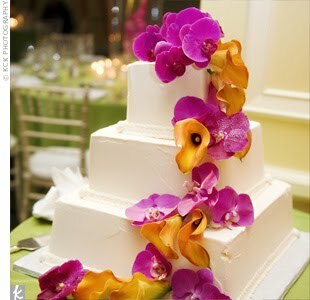 FIND THE RIGHT PASTRY PRO: If you want something more unique than your caterer has to offer, hire a specialty cake maker. 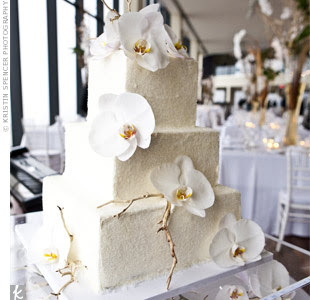 (But remember: Your caterer may charge a cake—cutting fee of $1 to $8 per slice.) 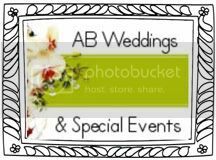 Get referrals from recent brides, then check out the bakers’ websites. Rule out anyone whose design aesthetic veers too far from yours. 3. MEET WITH YOUR TOP PICKS. View their portfolios and displays, and describe the cake you have in mind. Attend a tasting (some charge a fee for this, but may deduct it if hired). 4. OFFER PROPS for inspiration – a dress swatch, a photo of your bouquet or site, or anything that can help your baker visualize what you want. 5. GET A SIGNED AND COUNTERSIGNED CONTRACT that includes the flavors, fillings, frosting, and decoration, including the topper; the number of tiers and servings; the date, time, and location of delivery; and the total cost, including any deposit and a due date for final payment. Ask the baker if she can attach a drawing or photo. 6. WHEN CHOOSING FLAVORS, go seasonal. Order a cake that complements the calendar, such as peach or blueberry in summer, or peppermint or ginger- bread in winter. Marrying in the fall? A pumpkin cake with maple buttercream filling is pure autumn. 7. SELECT FLAVORS that match your party’s mood. A mango-passion fruit cake at a beach wedding? Perfect. At a Texas barbecue? Not so much. Ask your baker what flavors would make a fitting end to your wedding meal. 8. PICK TRENDS CAREFULLY. Go with flavor combinations that will be intriguing–but still palatable–to your guests, such as a Key-lime cake with coconut icing. 9. THINK ABOUT PLATING. Colorful frosting and fillings make a graphic statement on the plate and can complement a decorative element or theme. 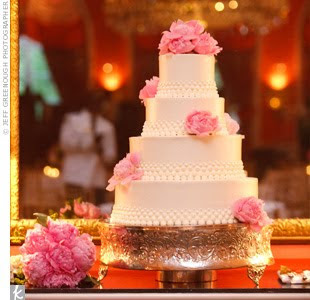 Fondant tinted pink, for example, would echo the pastel peonies in a bride’s bouquet. 10. COMBINE YOUR FAVORITES. He’s wild about raspberries; you have a thing for chocolate? It’s a match made in buttercream! Try this: a chocolate cake made of alternating layers filling with raspberry jelly and chocolate mousse.